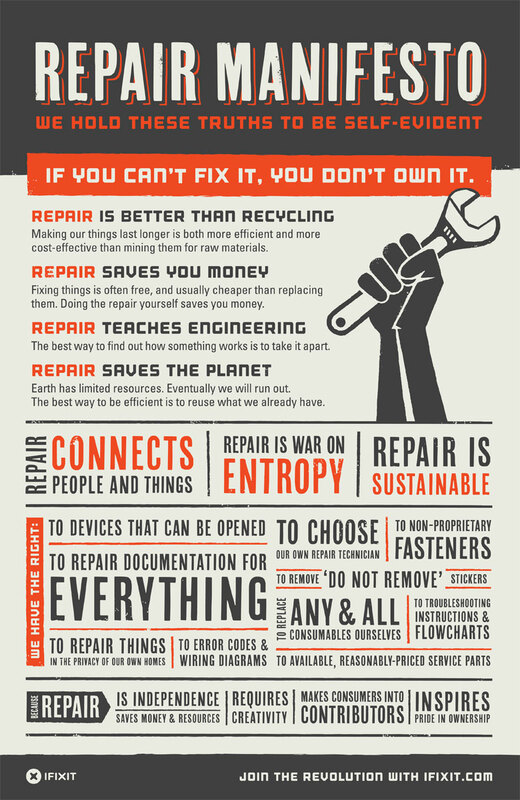 iFixit.com has posted their “Repair Manifesto” and it just so happens to be everything that I believe in. Why waste by throwing things out when it could just be fixed? I repair everything I can from electronics, cars, plumbing, lawn mowers, computers, musical instruments, furniture, toys…basically anything! This entry was posted in Community, Computers and Hardware, Environmentalism, Hobbies, Home and Homestead, Made in the USA, Personal, Projects, Upgrade. Bookmark the permalink.